A new addition to my vintage series. The location for this image is Scranton Lace Company which I photographed on an Abandoned America workshop. I believe I have been there at least four times so I have a vast amount of images from there. The man is one of the e-vint.com images I purchased and the sailboat I photographed a few years ago from Battery Park in Manhattan. The water reflections are actually on the floor in the original image and they caught my eye when I was at Scranton Lace. 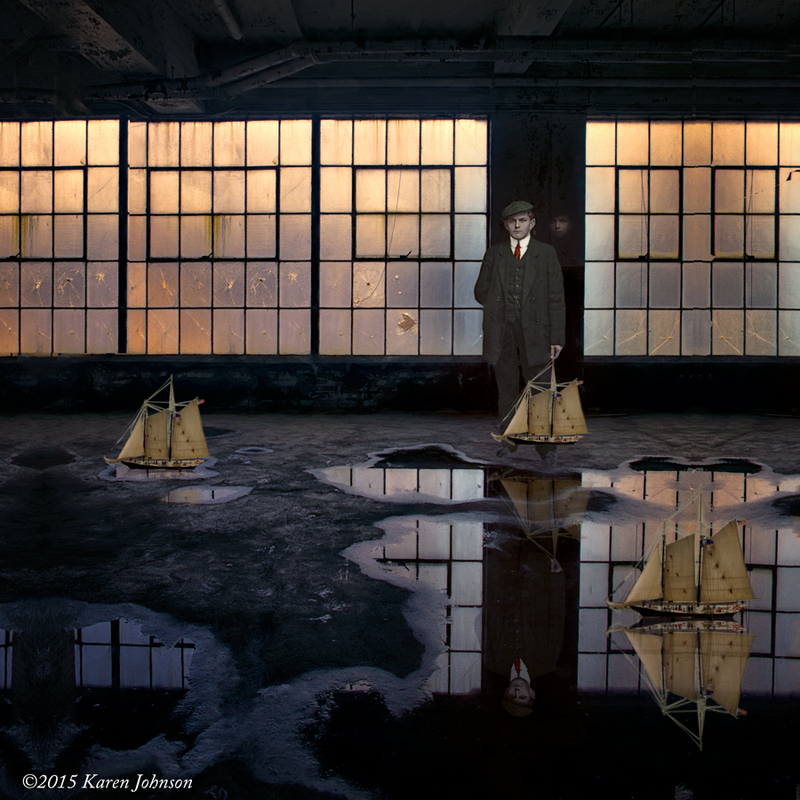 The reflection of the man holding the sailboat was added as well as a ghost image behind him. I had tried putting fish in the reflections but I happened to remember the sailboat I photographed and thought it would be interesting to have them sailing on this imaginary ocean. Scranton Lace was photographed with my Fuji X-Pro 1 and the sailboat with my Pentax K-5. I processed the composite in Photoshop CC using Macphun Intensify, Topaz Impressions, Topaz Restyle and Nik Color Efex Pro 1. Karen, your work is so interesting! And wonderful. Thank you Harold! I really appreciate it! Hey Karen…love all the reflections!! They add a whole other dimension to this piece! Nice work! !